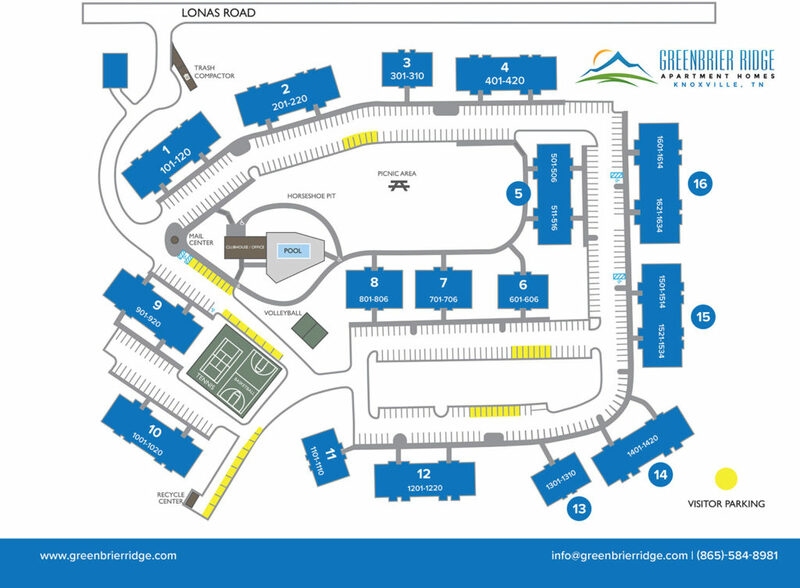 All resident vehicles parked on Greenbrier Ridge property must display a property parking decal. Any vehicle found in a resident parking spot without a proper parking decal will be subject to IMMEDIATE IMMOBILIZATION/TOWING WITHOUT FURTHER NOTICE OR WARNING. Guest vehicles are permitted to park in the designated visitor parking spaces (highlighted in red on the map). In the event that your personal vehicle has an emergency issue and the leasing office is closed, you may contact Strategic Parking Solutions (SPS) at 1-800-652-0427 to advise them of the situation until you are able to contact the leasing office.